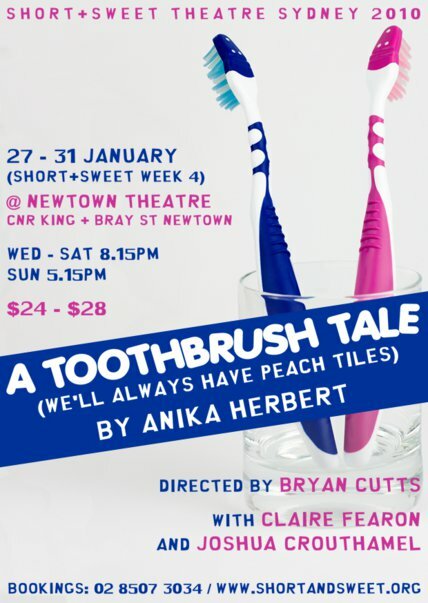 ‘A Toothbrush Tale’ by Anika Herbert, and directed by Bryan, has been selected by the Short and Sweet Theatre Festival, to close the week 4 programme, each night. Opening on Wednesday 27th and running until Sunday 31st January, the week 4 selection of short plays will be presented at the Newtown Theatre for the entertainment of all theatre-lovers. unrequited love. Pink, who has eyes for Blue, learns things about him which aren’t quite what she expected. After all the plays have been presented, the audience is invited to participate by voting for their favourite play… perhaps ‘A Toothbrush Tale’ will secure your vote. To book your tickets for Short and Sweet, click here.